My sister came on Saturday and we've been busy busy doing things with her. I have been walking a lot too because I want to induce labor naturally. I heard walking a lot helps. But so far I haven't have any contractions yet. I guess the baby really doesn't want to get here before his official due date, which is two days from today! Hopefully he doesn't come later than that. I am kinda sick of being pregnant at this point. It's getting SO HEAVY! 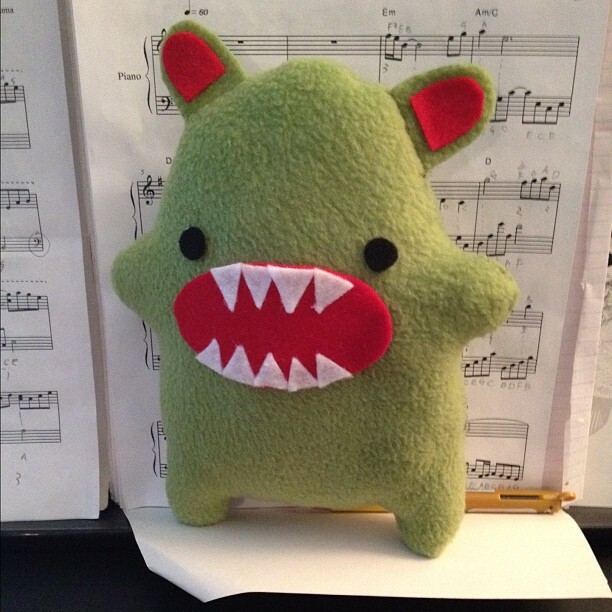 I made this cute little monster in a couple of hours the other day. I drew the pattern myself and hand-sewn it. I think I am getting better at hand-sewing even though I dreaded it a couple of weeks ago. It is taking longer than I had wanted though, so I guess I might get a sewing machine in the near future. Baby Liam has been moving a lot lately. One night he moved so much he woke me at like 4.30am. Since I couldn't fall back asleep, I just laid there and felt him do his dance. It was kinda fun that he was so active, but I worried that he was moving so much because he felt squished and uncomfortable. My sister feeling Liam kick. She was so tickled. 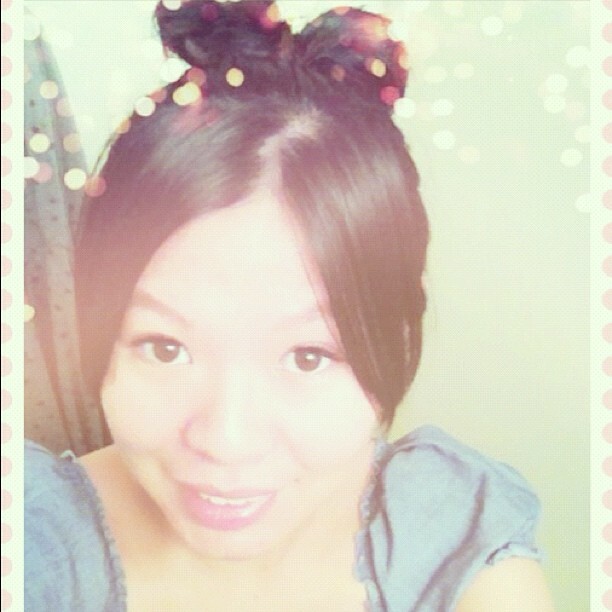 I was bored so I tried this bow bun I saw. It's so easy and cute! More than a decade ago, I was moping the floor at home per my mom's request. I was alone at home and the TV was on. I was watching a news about two planes flown into some buildings in the U.S.A. At first, I thought it was a movie trailer or something. It couldn't be real. Then I thought it might be an accident. But the news reporter was saying something about terrorism. Terrorism, what a strange concept. Even in my own language I couldn't really understand what it meant. I remember thinking, "those poor people in the plane. It must be so painful to die like that." A few minutes later, when the towers came down, I stopped mopping the floor, my eyes glued to the TV, in disbelief. It was just terrible. And I thought, who would do this on purpose? Who would commit suicide and kill so many people? Who could be so heartless? What are the Americans going to do? When President Bush declared war, I thought, "Oh no! Afghanistan is toast!" To me, it was a war so far away and had no immediate effect on me personally. My life was not affected in any remote way. I went to school like normal, came home like I did everyday, and went to church without giving a second thought that our elders were Americans and they might be hurting in their heart! I guess the war did change something in my life, like the headlines of the news was about the war for a long time, the couple missionaries and the elders talked a little bit about it (they were not supposed to read news), and some of my friends at school were talking about it as if they knew what was really going on. After 11 years, 9/11 meant something more to me now. I don't personally know anybody who was in that tragic event but I felt for families of the victims, and the American soldiers that served in the war. 11 years ago, I was a bystander looking in from outside. I am not sure if I will ever become an American citizen but after 11 years I no longer feel like a bystander. I love this country. I am proud of it. My son will be an American citizen. He will, like my husband, love this country with all his heart. I hope the world that he is born into is a peaceful and trouble-free world, where people respect each other and not solve problems through violence and prejudice. That may be a wishful thinking, but I am optimistic. I think our descendants are smarter than us. They are more tolerant and open-minded and they will excel and create a better world. One day, when Liam goes to his history class and learn about 9/11, I would tell him that his mom and dad witnessed a historical event that changed the world and what his mom has learned from it. I will tell him that he is lucky to be in a country where people can worship Jesus and Heavenly Father openly and freely, and a place where he doesn't have to worry for his or his family's lives. He is truly blessed. We are truly blessed. Liam, please be here soon! Like, today!